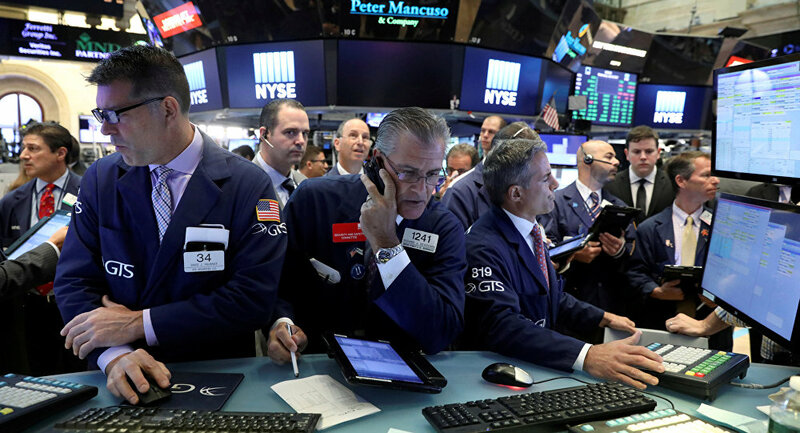 The US stock market saw a major sell-off as the Dow Jones industrial average dropped another 4.6 percent on Monday, or about 1,175 points, after plummeting 666 points on Friday. The index sat at 24,342 at the close of trading, down from an all-time high of 26,616 on January 26. Once the Dow Jones industrial average fell 800 points earlier on Monday, it had effectively wiped out all of its 2018 gains. At one point, the Dow had fallen 1,579 points, the largest intraday negative swing in the Dow's history. The total point fall for the day, 1,175, was the largest decline in the Dow's history, but it was not the largest percentage decrease in the Dow's history. On September 29, 2008, the DJIA plummeted 777 points, a 6.98 percent fall. The once-celebrated Dow surge past 25,000 is now a thing of the past. All 30 components of the Dow Jones industrial average turned negative on Monday, with the energy, health care and financial sectors sustainining the biggest losses within the Dow. "On Friday, the stock markets were under heavy selling with the Dow Jones industrial average suffering one of the worst one-day point declines in history. Looking back, we find disturbing similarities with the period just before the biggest single-day stock market crash in history: the Black Monday in 1987," Dr. Tuomas Malinen, chief executive officer at GnS Economics, wrote on February 4. ​"The stock markets have been pushing higher for several years and interest rates have been very low for an extensive period of time but are now trending upwards. The dollar has fallen, the US trade balance is negative, economic growth has been sound but doubts about it are starting to linger and the inflation expectations are rising. Corporate profits have also recovered strongly from a previous slump. All these developments preceded the 1987 crash," says Malinen, also a professor at the University of Helsinki. ​US President Donald Trump has gloated over the growth in value in the stock market since entering office, but a decade after the financial crisis, the most recent two-day downturn shows the bull market run has lost substantial momentum. Goldman: "This is not 1987"
Speaking in Ohio before the Dow's closing bell rang, Trump announced that the most recent tax cut package "set off a tidal wave of good news," even as stocks plummeted, the bond market flash crashed, and the Dow ended up negative for the year. ​USA Today columnist Adam Shell wrote on Friday that a New England Patriots victory at Sunday's Super Bowl "could hurt the stock market." This prediction has turned out to be something like "fake news:" the Patriots lost and stocks are down anyway. ​In her final interview before passing the baton as chair of the US Federal Reserve to Jerome Powell, Janet Yellen said stock market valuations were inflated. "Well, I don't want to say too high. But I do want to say high," Yelled told CBS News Monday. "Price to earnings ratios are near the high end of their historical ranges." On top of lofty equity valuations, Yellen explained that commercial real estate values are "quite high." "Now, is that a bubble or is too high? And there it's very hard to tell. But it is a source of some concern that asset valuations are so high," Yellen said. Powell was sworn into the role of chair of the Federal Reserve on Monday, leading some Twitter users to joke "welcome, Chairman Powell!" 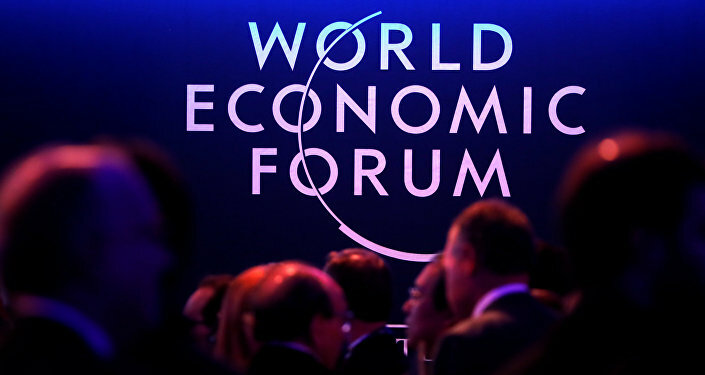 Speaking to Sputnik, economist Steve Keen explained that with the current business environment, world leaders were under the impression "the world economy can run a marathon in record time" at World Economic Forum in Davos. "Of course, when they're panicking it's after a crisis, and when they're relaxed it's before a crisis," Keen observed.